At last a safety system for quad bikes that helps protect the rider. Quad bike accidents have claimed 45 lives and caused 17,000 injuries in the last decade mostly in the farming community. This simple device will help save lives. The Quadbar (TM) is a small unobtrusive, hairpin shaped hoop mounted on the quad bike behind the rider designed to counter some of the risks associated with rollovers. The Quadbar acts as a Passive Roll Over Protective Structure (PROPS) as opposed to the more commonly known Roll Over Protective Structures (ROPS). 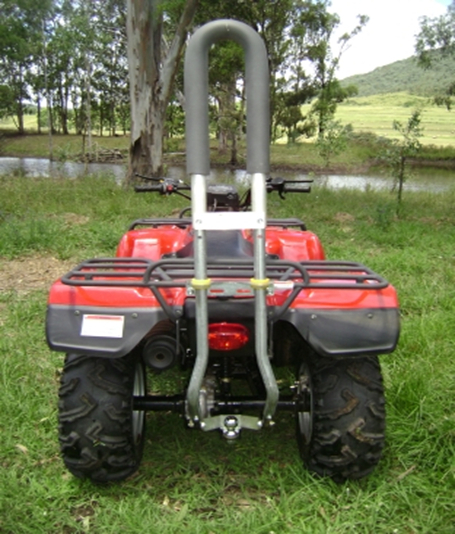 A typical ROPS would require a full cage and driver restraint, which are not feasible on a rider active vehicle such as a quad bike. The Quadbar is mounted on the tow bar and is telescopically adjustable at the base. A support mount is attached to the rear rack, where the bar passes through sliding collars (bushes), which subsequently allow the suspension to move freely. The use of the tow bar is not affected by attachment of the Quadbar. The Quadbar has been designed to help prevent the operator from being pinned beneath an overturned quadbike. It is also designed to reduce crushing and pinning injuries and fatalities in cases of quadbike back flip. The Quadbar has particular application where usage is generally considered safe, and the rollover is inadvertent, such as work place environments like farms and forestry and some limited types of recreational use like touring. The Quadbar cannot be fitted to the sports type bike where the operation is generally considered risky. The Quadbar is essentially a bolt on attachment. Currently 1 kit should fit most bikes that are fitted with a tow bar & rack. However some of the less popular bikes may require variations of the brackets.